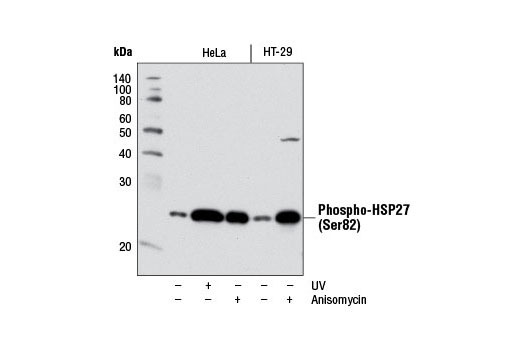 Western blot analysis of extracts from HeLa or HT-29 cells, untreated (-) or treated (+) with either UV (40 mJ/cm2 with 30 min recovery) or anisomycin (25 μg/mL, 30 min), using Phospho-HSP27 (Ser82) (D1H2F6) XP® Rabbit mAb. 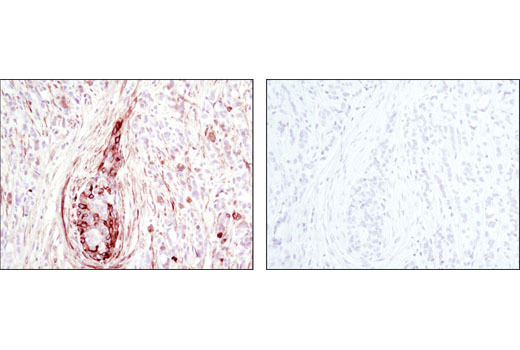 Immunohistochemical analysis of paraffin-embedded human breast carcinoma, control (left) or λ phosphatase-treated (right), using Phospho-HSP27 (Ser82) (D1H2F6) XP® Rabbit mAb. 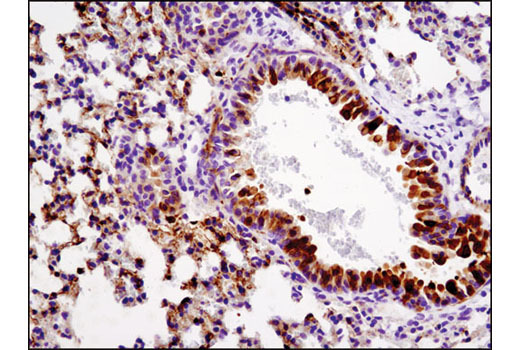 Immunohistochemical analysis of paraffin-embedded mouse lung using Phospho-HSP27 (Ser82) (D1H2F6) XP® Rabbit mAb. 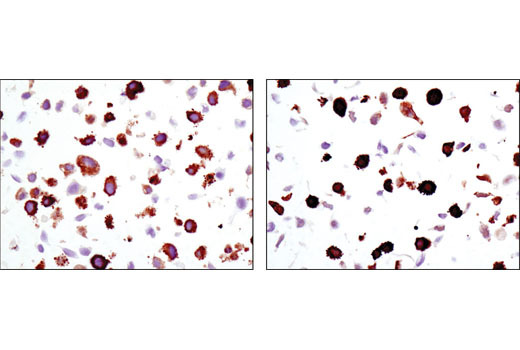 Immunohistochemical analysis of paraffin-embedded HeLa cell pellets, control (left) or UV-treated (right), using Phospho-HSP27 (Ser82) (D1H2F6) XP® Rabbit mAb. 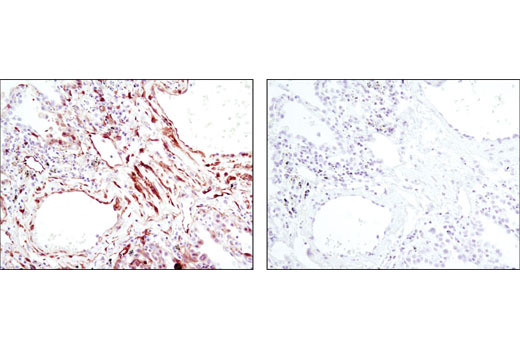 Immunohistochemical analysis of paraffin-embedded human lung carcinoma using Phospho-HSP27 (Ser82) (D1H2F6) XP® Rabbit mAb in the presence of control peptide (left) or antigen-specific peptide (right). 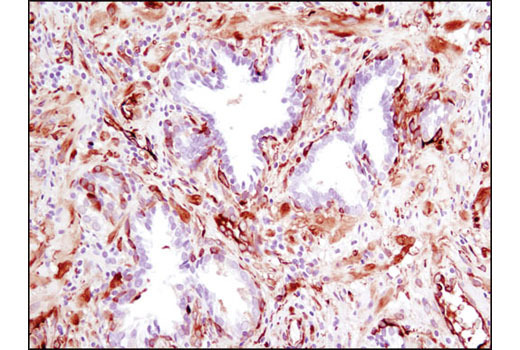 Immunohistochemical analysis of paraffin-embedded human prostate carcinoma using Phospho-HSP27 (Ser82) (D1H2F6) XP® Rabbit mAb. 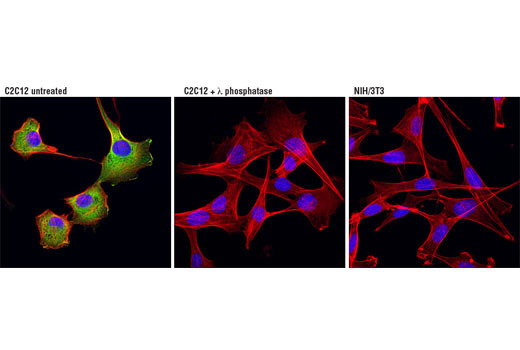 Confocal immunofluorescent analysis of C2C12 cells, untreated (left) or treated with λ phosphatase (middle), and NIH/3T3 cells (right) using Phospho-HSP27 (Ser82) (D1H2F6) XP® Rabbit mAb (green). Actin filaments were labeled with DY-554 phalloidin (red). Blue pseudocolor = DRAQ5® #4084 (fluorescent DNA dye). Negative staining in NIH/3T3 cells is in agreement with the observation that NIH/3T3 cells do not express HSP27 under basal conditions (5,7). Flow cytometric analysis of HeLa cells, untreated (blue) or UV-treated (green), using Phospho-HSP27 (Ser82) (D1H2F6) XP® Rabbit mAb. 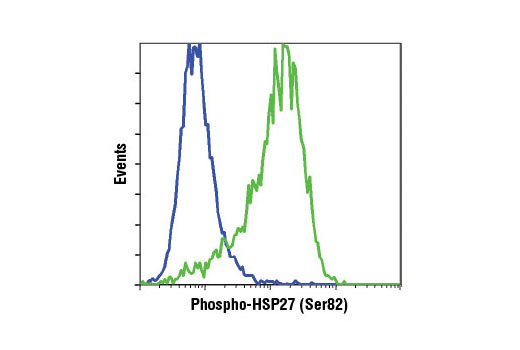 Phospho-HSP27 (Ser82) (D1H2F6) XP® Rabbit mAb recognizes endogenous levels of HSP27 protein only when phosphorylated at Ser82. Monoclonal antibody is produced by immunizing animals with a synthetic phosphopeptide corresponding to residues surrounding Ser82 of human HSP27 protein. Heat shock protein (HSP) 27 is one of the small HSPs that are constitutively expressed at different levels in various cell types and tissues. Like other small HSPs, HSP27 is regulated at both the transcriptional and posttranslational levels (1). In response to stress, the HSP27 expression increases several-fold to confer cellular resistance to the adverse environmental change. HSP27 is phosphorylated at Ser15, Ser78, and Ser82 by MAPKAPK-2 as a result of the activation of the p38 MAP kinase pathway (2,3). Phosphorylation of HSP27 causes a change in its tertiary structure, which shifts from large homotypic multimers to dimers and monomers (4). It has been shown that phosphorylation and increased concentration of HSP27 modulates actin polymerization and reorganization (5,6). Arrigo, A.P. and Landry, J. (1994) Cold Spring Harbor Laboratory Press, NY, 335-373. Landry, J. et al. (1992) J. Biol. Chem. 267, 794-803. Rouse, J. et al. (1994) Cell 78, 1027-37. Rogalla, T. et al. (1999) J. Biol. Chem. 274, 18947-18956. Lavoie, J. et al. (1993) J. Biol. Chem. 268, 24210-24214. Rousseau, S. et al. (1997) Oncogene 15, 2169-2177. Aoyama, A. et al. (1993) Mol Cell Biol 13, 1824-35.